After 3 months I have managed to model 14 industries and code all of them in the last two weeks. Creating some industries took more than the others, especially huge amount of effort was put into 3-X Machinery Factory, with all the robots being animated and the car being assembled. Only the Worker Yard gets the 404 graphic for now. 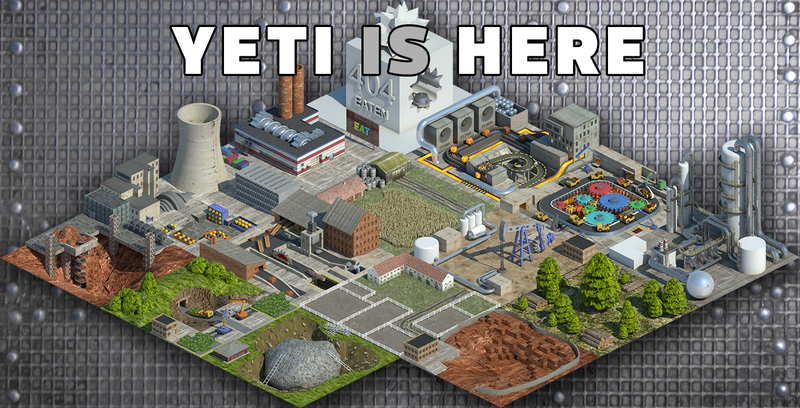 – The Worker Yard outputs amount of YETI dudes based on current year (so it will grow no matter what), but the production can be increased by Food and Building Materials. Both of Food and Building Materials should have the same effect. – Other industries all work simply based on Consume->Produce method, even “primaries”. This is done over time so you do not get all of the production immediately. 10% of cargo currently waiting is consumed and produced. – There are only 15 industries, Plantation / Orchard is missing due to missing sprites And coincidentally I am somehow unable to add 16th industry… to be added later. NUTS Unrealistic Train Set 0.7.2 Universal wagons are able to load YETIs (Workers), and will show specific sprites. Older NUTS versions also work but will show just flatbed crate graphics. Currently the file has 30MB, and I have not yet added a single animation. Right now I just want to release this as 0.0.1, and add fancy things later (animations will probably go asap). Just use an appropriate vehicle set which supports it. for trains: NUTS is best, Pineapple trains works too. Others I haven not tested.